I have some great food pictures for you, but my photographers have been very busy with their own lives and have yet to give me the pictures. I'm thinking about firing them, but in the mean time, please enjoy this pie head picture taken on my high-quality computer camera. 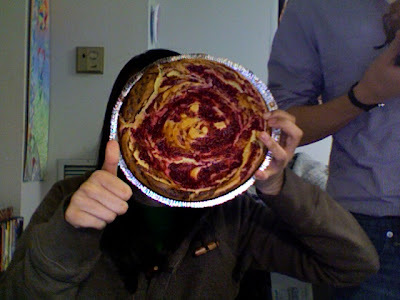 It is a raspberry cheesecake swirl made by Alex.